As WTOP prepares to leave its Northwest D.C. location for new digs in Chevy Chase, Maryland, crews on a crane scaled the station's current HQ to carefully remove the station's call letters Friday morning. WASHINGTON — It’s the end of an era. As WTOP prepares to leave its Northwest D.C. location for new digs in Chevy Chase, Maryland, crews on a crane scaled the station’s current HQ to carefully remove the station’s call letters Friday morning. Early next year, the Glass-Enclosed Nerve Center will move to a new building at 5425 Wisconsin Avenue. Federal News Network (WFED) is also making the move. 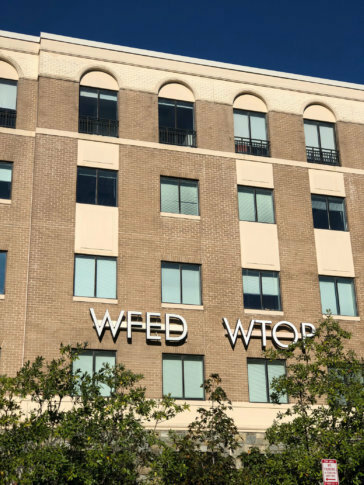 Both stations’ light-up call letters have been emblazoned across WTOP’s Idaho Avenue Northwest building since 2006. WTOP has been in its current building for nearly 30 years. What happens to the call letters now? Initially some staff members had planned to divvy up individual letters as souvenirs, but it turns out they’re all bolted to a single backing bar and interconnected with electrical wires. The letters are also pretty hefty. There are tentative plans to store the letters at WTOP’s transmitter site in Wheaton, Maryland.